An account of Russell Osborne’s adventures through his own hand. Edited from the original manuscript and originally printed in a limited edition of 750 copies. Born in a little Maine Village in 1814, Osborne Russell ran away to sea at the age of sixteen, but he soon gave up seafaring to serve with a trading a tapping company in Wisconsin and Minnesota. IN 1834 he signed up for Nathaniel Wyeth’s expedition to the Rocky Mountains and the mouth of the Columbia. 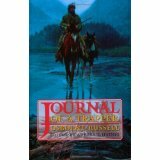 Subsequently he joined Jim Bridger’s brigade of Old Rocky Mountain Fur Company men, continuing with them after a merger that left the American Fur Company in control of the trade. When the fur trade declined, he became a free trapper operating out of Fort Hall, staying in the mountains until the great westward migration began.